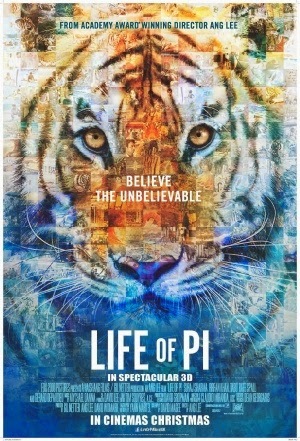 An incredible story that initially struggled to see the light of day, Yann Martel's renowned 2001 novel Life of Pi blends a complex level of adventurous storytelling with religious allegory and spirituality - and now director Ang Lee has brought this fantastical tale to the big screen, but does it capture that same level of emotion? An unnamed local author (Rafe Spall) approaches Indian immigrant Pi Patel (Irrfan Kahn) after a referral from his uncle that the man's story would form the basis for a compelling novel and, as Pi relates, will make him believe in God. Pi then divulges his story from his teenage years, where he (Suraj Sharma) and his family are caught up in a disastrous shipwreck when moving their zoo overseas. Pi is the only survivor, and is left stranded on a boat for 227 days with their bengal tiger Richard Parker - and that, as Pi explains, is where his greatest journey begins. Life of Pi is a visual delight - the story itself almost renders the whole project impossible, with the majority of it taking place in the expanses of the ocean with a young boy and vicious tiger stranded in a wooden lifeboat. But of course - Sharma was never at sea, and he was never joined by a real tiger. That may seem like an obvious comment, bit once you see the film, you will have a hard time believing it. Rhythm and Hues Studios have crafted some magnificent CGI special effects which are sometimes very clearly synthetic detail wise but are a visual treat and immensely believable - Richard Parker himself is animated so fluently that he might as well have been a real tiger. Not only this, but there are some gorgeous theatrical moments in the twilight sea and some fantastic use of cinematography - all this combined with a deep and touching score by Mychael Danna makes Life of Pi a huge aesthetic achievement. Life of Pi not only excels at visual design but also in terms of unique and innovative storytelling - the bond between Pi and Richard Parker is incredibly touching and developed at a beautiful pace. Richard Parker himself is portrayed as a deep and enjoyable character instead of a mindless animal, and him and Pi's relationship carries into many of the film's themes. It's been a while since a film touched me to this degree, and Life of Pi truly tugs on the heart strings towards the end (and even a fair bit at the beginning) which really allows the audience to engage with the narrative and themes rather than watch characters weep and expect to feel sad. It's all wonderfully acted and edited into nicely flowing story - the jumps back to present day were an older Pi details his story to the novelist provides more backbone to the overall plotting instead of feeling like jarring tonal shifts. Life of Pi is an authentic and emotional masterpiece, with humour, adventure and a ton of emotional resonance - it deserves to be a success and deserves to be met with praise, for it's a story unlike any other that will draw you in with incredible production value and fantastic storytelling - and it's surprisingly made even better in 3D, which in itself is treated as a visual art over a cheap gimmick. Don't hesitate - go see it.